It got me thinking about these so called diets, which to me is when someone cuts out a food group/s for periods of time. They never work because you know when the diet is over you will get to eat those foods again, so what's really going to change? I've always been a firm believer in eating well as a lifestyle. Reducing my sugar intake is something I'm going to have to do slowly, and is something I've been consciously doing for a while. For example, whenever I bake a recipe that calls for one cup of sugar, I'll halve it, or replace it with honey. I won't make things that are heavily sugar based (except for marshmallows cos they are amaze-balls). My tolerance for sugar has dropped as well - these days I find things too sweet. I'm my efforts to not buy another bag of Mars bars and eat them all, I wanted to make a healthy snack that was good for me and involved NO SUGAR. These babies, they have no sugar, no gluten, no dairy, and no egg. And, they're yummy! 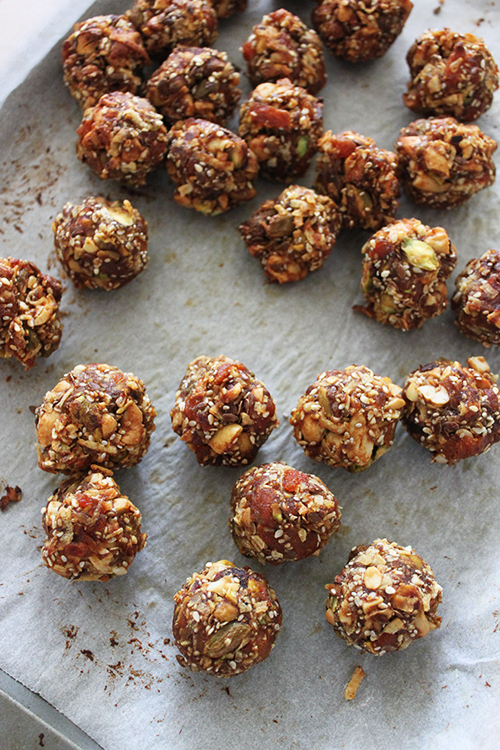 Feel free to mix it up and use your favourite dried fruits or nuts (except keep the dates of course). And if you can, try to use stuff already in your pantry, as these can get a little expensive if you have to go and buy everything! 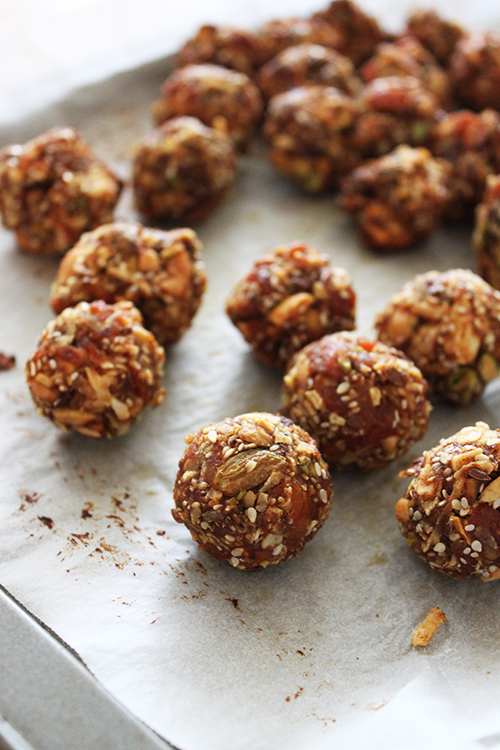 When I made these, I only had to buy the apricots and cashews, everything else was randomly in my pantry. Preheat the oven to 160C. Line a tray with baking paper. In a small saucepan, add the dates and water, and cook for 5-10 minutes, or until they are soft and the water has been absorbed. 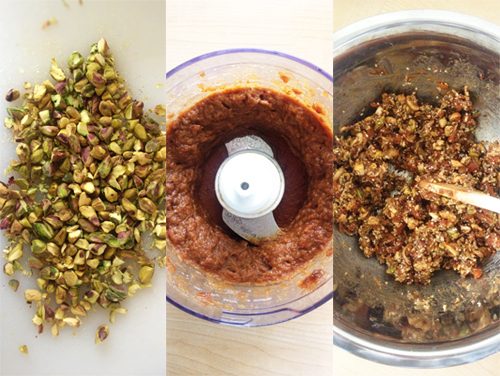 Use a wooden spoon to mash the dates up a little, then place the mix into a food processor and blend til smooth. You might need to add a little more water to loosen it should the mix be too thick. It should be the consistency of baby food. In a large bowl, add all the chopped fruit, nuts and seeds (all other ingredients! ), then add the pureed date and mix well so it's all evenly incorporated. Last ball reference, I promise. Did I mention the nuts though? These look great. I'm of the same opinion as you, it's better to have a healthy lifestyle with occasional treats to crash dieting. Though I must admit I prefer to have no exceptions to the healthy eating in the beginning, just for a while to help my tastes buds adapt. Love the look of these but I can't get fresh apricots. Can you use anything else? there is no mention of the temp for the oven to cook them. can I use prunes instead of dates? Hi there! Yes, it's 160C, mentioned at the start :) I'm not sure about prunes, it might need to cook for longer due to the greater liquid content in prunes.